In the Age of Aquarius, possession is losing its significance. What is becoming more and more important is the access to the physical through the virtual. Access to information through the Internet makes it possible for us to use shared resources more easily and more efficiently, as a community. In that sense, we share the world. Now, more than ever. On top of that, we can gain from other people’s experiences of the available resources much more than before. These are also shared publicly and help us make our own decisions – doctors, hotel rooms, restaurants, attractions, cars, merchandize. By now, there is probably a review on every human activity possible somewhere on the Internet. 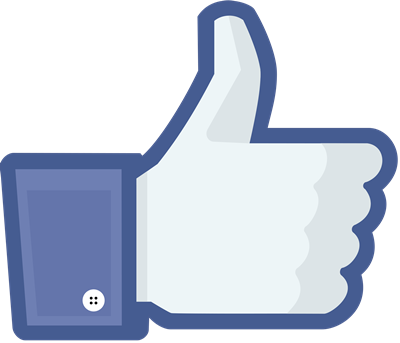 The above image is probably one of the more familiar icons of that trend, the like button. It is a common feature in social networks, and other Internet forums, where users can express their support of certain content. Being out there with good or bad reviews is a strength but also a risk. Anyone can say whatever they think, including your market competitors. People looking for a place or a service may use this information to get the service or to avoid it. Your business or product may rise or fall based on how it is reviewed. Human nature has not changed over time. Throughout history people were sharing their experiences, making reviews through word of mouth, and making decisions based on this information. As in many other areas, the new influence that the Age of Aquarius brings is the immense increase in the number of people who are now exposed to such information, and the amazing speed at which this exposure takes effect. If you think about it, there is no limit to the number of people who could be exposed to online information, and there is almost no limit to the speed of this to occur. All one needs is a cell phone or any kind of access to the Internet. 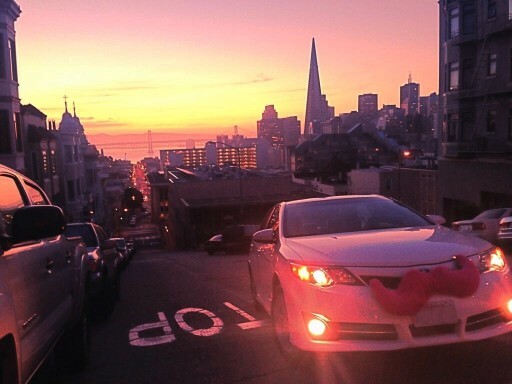 Lyft’s pink car mustache (photo by Pkg203). Lyft is one of the many car sharing program in existence throughout the world. The sharing of information allows people in cities and around the world to share real physical resources. A good example is the car sharing initiative in many cities in many countries. Car sharing is a model of car rental where people rent cars for short periods of time, often by the hour. They are attractive to customers who make only occasional use of a vehicle, customers who would not like the burden of maintaining a car, as well as others who would like occasional access to a vehicle of a different type than they use day-to-day. The organization renting the cars may be a commercial business or the users may be organized as a company, public agency, cooperative, or ad hoc grouping. The main platform for the many existing providers is the Internet and social networking. These initiatives, which became possible with the permeation of the Internet into our lives, forced even the traditional rental companies and car manufacturers to introduced their own car sharing services. Millions of people are now using these services around the world, and the field is growing. Airbnb, another example for sharing material property through social networking, is an online marketplace for vacation rentals that connects users with property to rent with users looking to rent the space. Property profiles include details such as user reviews and shared social connections to build a reputation and trust among users of the marketplace. Other elements of the Airbnb profile include user recommendations and a private messaging system. What does the Age of Aquarius hold in that respect? Probably much more of this resource sharing accessed through mobile applications, faster and in more areas. We see it already with the advent of cloud computing. Cloud computing lets users share files via the Internet while the Web-based service hosts the programs users need. Remote machines run everything from e-mail to word processing to complex data analysis programs, while the user’s computer runs software that hooks up to the cloud, like a web browser. Web-based email, like Gmail is an example of a cloud service. Picasa, the image organizer now owned by Google, is another example. Cloud services are usually cheaper, faster, and allow private people and smaller companies to have access to resources they could not have allowed themselves on their own. Even academic research is opening its doors to the common people, seeking to utilize their human capabilities, such as pattern recognition, as well as the cumulative computing power of their PCs instead of applying for usage time on expensive super computers. One such example is Zooniverse, where “citizen scientists” are helping scientists to find planets, to transcribe ancient texts, to study the weather, and so on. Of course, all of that progress towards sharing the world through the Internet is not without risks. Among these are risks of quality, reliability, availability of services and data, security, complexity, regulations and legal issues, performance, reversion, and lack of standards. 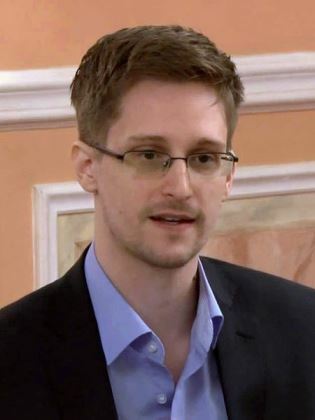 One of the most significant risks is that of privacy. Personal or professional data may be compromised, deliberately or accidentally. Personal data is already being used by advertisement programs that match the advertisements to the content of our emails or to our browsing history on the web. As the technology advances, so it is likely that the risks and especially the privacy problems will become part of our lives, whether we like it or not. Social protests are not a new thing in human history. Social media protests are. People actually get the idea of what to protest about and the idea of how to do it by being exposed to similar protests in other countries through social media. And they use the media to promote and put together their demonstrations or other means of protest. The influence of the Age of Aquarius is about the spread of ideas, about the power of the people, about the technology that helps people spread ideas, such as Facebook, Twitter, cellular technology, and the internet in general. And it is also about the unrest. When everything is so globalized as it is today, when people learn about something other people have or about how other people got what they wanted through protests, then they themselves start wanting to get the same things. Sometimes, the Aquarian Age technology is what is creating the very thing that people are protesting against. A good example is Global Warming caused at least partially by mankind’s technology. The Environmental Movement is organizing many of the protests against further industrializing and against the use of dirty fuels that will further damage the environment. 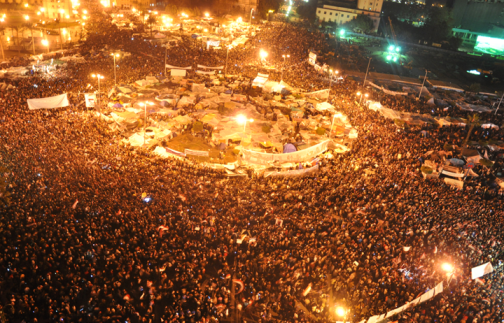 The Arab Spring has been a classic example of such a revolutionary wave since the end of 2010. Underneath the demonstrations, the protests, the riots, the civil wars, and the leader depositions underlies the social media, which is the platform that enabled many of these events. It enabled the organization of the events, the bypassing of the traditional ways of communication controlled by the governments, and the media coverage of the events, creating international support, which further encouraged and stimulated the events. The power of the people has prevailed in most of the Arab Spring countries, even in the face of the state attempting to repress people and to censor the internet. This is yet another Aquarian influence manifesting in these unfolding events. 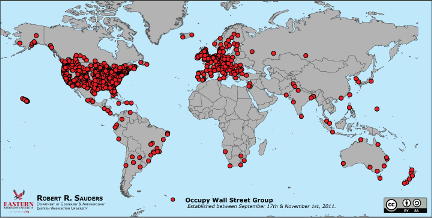 The geographic spread of the Occupy Wall Street movement (image by Robert R. Sauders). The Occupy Wall Street movement was partly inspired by the Arab Spring. It is an international protest movement against social and economic inequality that spread like fire in dry stubble, mainly in the Western World, but in other places as well (see enclosed map). Its primary goal has been to make the economic and political relations in society less hierarchical and more flatly distributed. That sounds a lot like an Aquarian influence – hierarchy is no longer appreciated. Moreover, it is viewed negatively because it has been abused by the ones in positions of power. Among the movement’s prime targets are large corporations and the global financial system and their control of the world to the disproportionately benefit of a minority, which undermines democracy and is unstable. 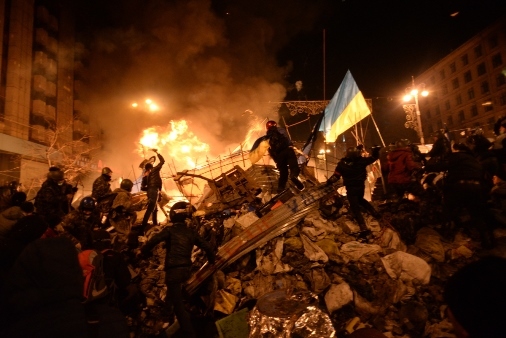 Occupy protests have taken place in hundreds of cities across scores of countries globally. Occupy activists have used web technologies and social media like Internet chats, Facebook, Twitter, and Meetup to coordinate events. We hear about similar events of mass protests everyday in more and more places. Both the protesters and the entities against which the protests are occurring are using the available technological platform. 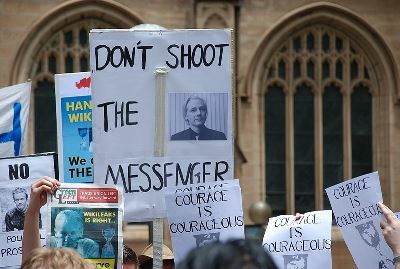 Protesters use these technologies to coordinate events, to bypass other media blockage, and to raise the level of international awareness. 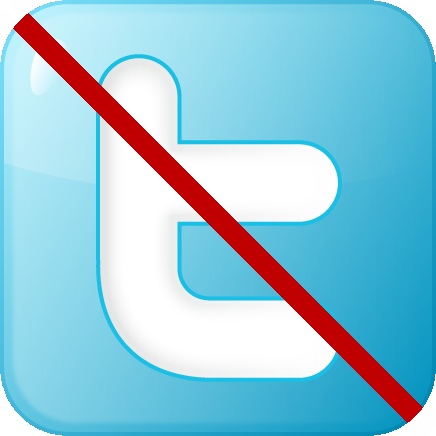 Governments use these technologies to block communications, as in the Twitter and YouTube ban in Turkey, or for discommunication, such as in the still developing crisis in the Ukraine or the devastating civil war in Syria. Even though it seems like the states involved still have the upper hand in some of these events, these are states that have not adapted yet to the new player in the game – the social activists using social media that will ultimately undermine the strength of the old players – states, corporates, and religions. 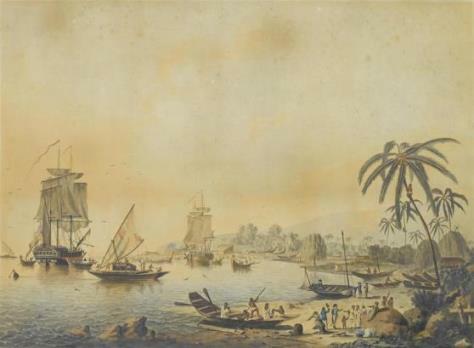 View of Owhyhee, one of the Sandwich Islands, also known as ‘The Death of Cook’ (John Cleveley the Younger ,1747–1786). James Cook was one of the greatest 18th century explorers. The transition from the Age of Pisces to the Age of Aquarius started about 500 years ago. One of the precursors of the upcoming globalization during that time was the voyages of exploration in the coming few centuries. During this period Europeans explored Africa, the Americas, Asia and Oceania. This led to the rise of colonial empires and a to a remarkable exchange of plants, animals, foods, human populations, diseases and culture between the old and the new worlds. These European explorers made it possible to globally map the world, resulting in a new world-view and distant civilizations acknowledging each other. 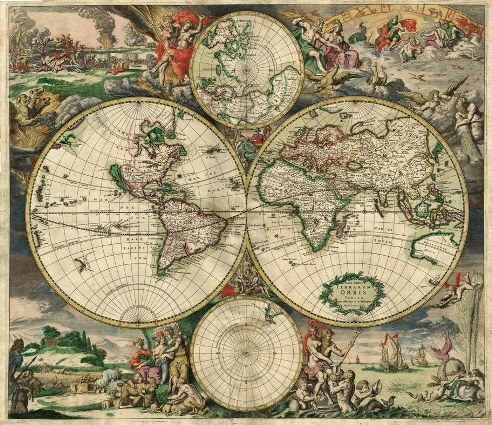 A 1689 world map from Amsterdam. What allowed this exploration on the one hand and what benefited from it on the other hand was the technological platform that got upgraded again and again over the last few centuries. For example, naval transportation created the need for better means of navigation, surveying and cartography, which in turn further improved the exploration capabilities. Still, by the beginning of the 20th century, there were some uncharted areas on our planet, white regions on the map. Some places in Antarctica, some of the highest mountains, and some of the deepest oceans never saw a human being. In the last century air transportation had the same effect on exploration that naval transportation had in the previous centuries. And space flight had the same effect in the last few decades. As means of transportation evolved, so did the means of communication – the mobility of information had to be improved along side. The last century saw great advancements on that front – radio communication, cellular communication, the internet, image transmission, video transmission, and live communication. Within the last few decades, the entire Earth got mapped and started being continuously monitored at different wavelengths. Mankind has started mapping other planets within our solar system. The increasing probing of our own planet and of other planets in conjunction with ever improving communication capabilities kept and keeps transforming our world view. Ultimately, it led to a more holistic view of the planetary system. Mankind has realized the impact of our very species on planet Earth and that led to the emergence of the environmental movement. 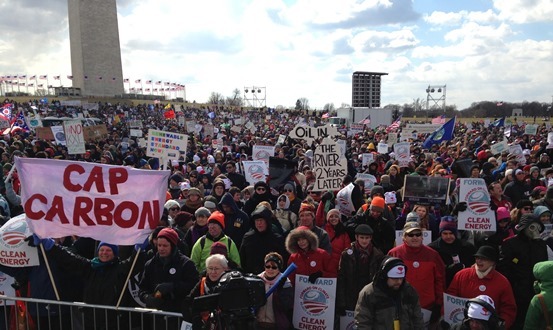 A protest near the Washington Monument in early 2013 to protest the Keystone XL pipeline and support action on climate change (photo by Jmcdaid). 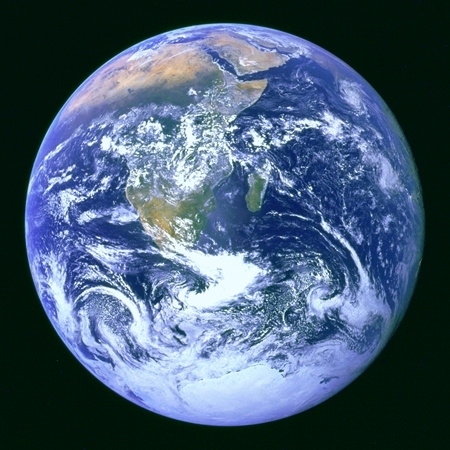 This new view of the Earth as a living organism, combined with the technological platform that enabled that point of view in the first place is now allowing people and organizations to turn against the very same entities that drove the accelerated globalization of the last few decades – the profit driven states, industries, and corporations. The expansion of certain industries into global scale many times came at the expense of the environment. But the availability of information through the internet and through social networks like Facebook, allows people to get organized, to scrutinize and to criticize some of the practices in these industries. One recent example is the environmental protests opposing the Keystone XL pipeline. This pipeline is supposed to allow the transport of 800,000 barrels a day of heavy crude from oil sands formations in Canada to Texas refineries, and will involve an oil extraction process that emits more greenhouse gases than other forms of production. This project moved into the political arena, as the environmental movement who backed up the election of President Obama is now using its political ties to urge his administration to reject the project. Like with other issues that are in the public eye these days, the new thing is not whether these kind of decisions are right or wrong, good or bad. The new thing is that these subjects are even on the table. What allows this to occur is the new tone that is set by the influence of the Age of Aquarius. It brings not just the technological means that allow these events to unfold, but also, and mainly, the intellectual openness, the flexibility of mind, the inventive thinking, the humanitarian approach, and, the rebellious nature of this sign and age.